Gelatin silver print. Vernacular snapshot. 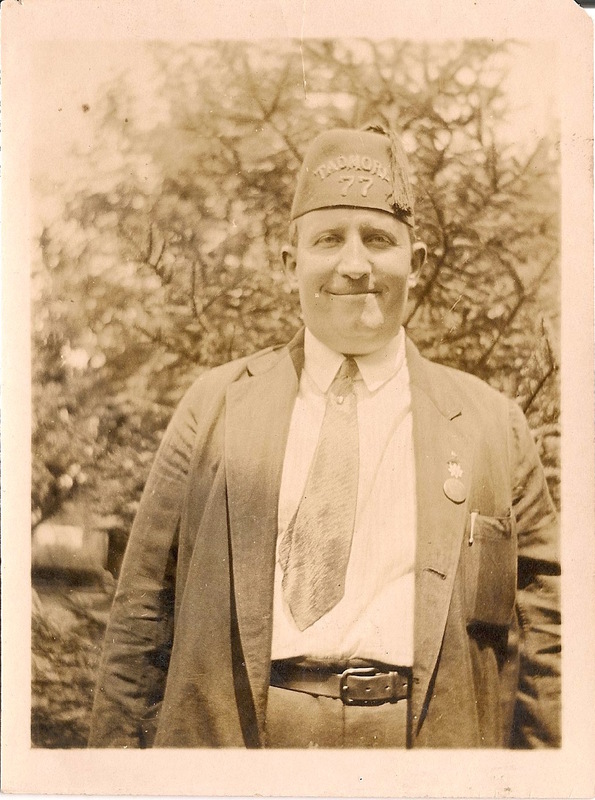 An ample man in a suit and tie, wearing a Tadmore Siesta fez. from the Princes of Bagdad. On the man’s lapel can be seen an eight-pointed star medal, which is probably an Ancient & Illustrious Order Knights of Malta ornament (assumed because all three men in this photo group wear matching fezzes and medals). Another, larger, round pin or medal just below his star. A pen can be seen tucked in his suit pocket. 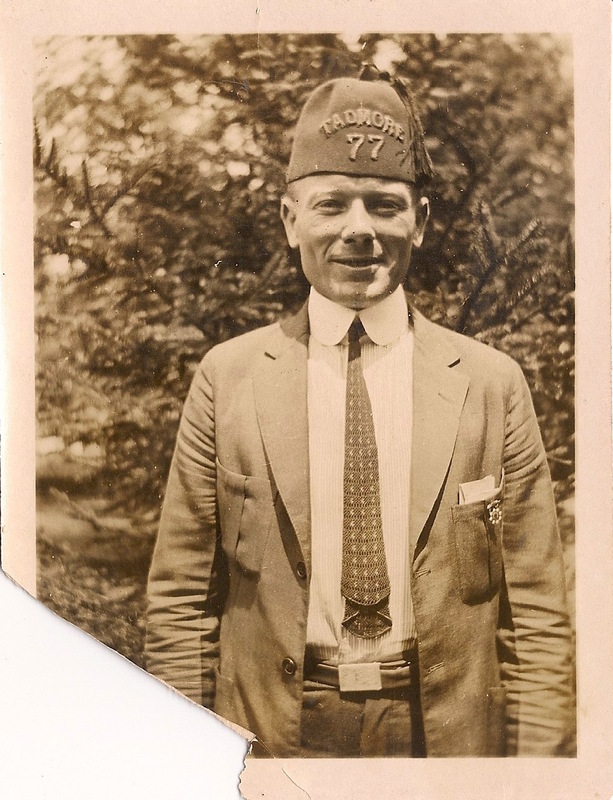 His fez appears to be embroidered with bullion, “TADMORE” above and “77” below. No scimitar emblem. Photographed in front of a tangled tree. Tadmore Siesta was in Reading, PA.
Verso, in pencil, a 3. An man in a suit and tie, wearing a Tadmore Siesta fez. (Princes of Bagdad). On the man’s suit pocket can be seen an eight-pointed star medal, which is probably an Ancient & Illustrious Order Knights of Malta ornament (assumed because all three men in this photo group wear matching fezzes and medals). Folded papers are stuffed in the pocket with the medal. His tie looks knit, and the bottom sticks below the top, and is reversed. A big, round man in a three piece suit and tie, wearing a Tadmore Siesta fez. (Princes of Bagdad). On the man’s suit lapel can be seen an eight-pointed star medal, which is probably an Ancient & Illustrious Order Knights of Malta ornament (assumed because all three men in this photo group wear matching fezzes and medals). 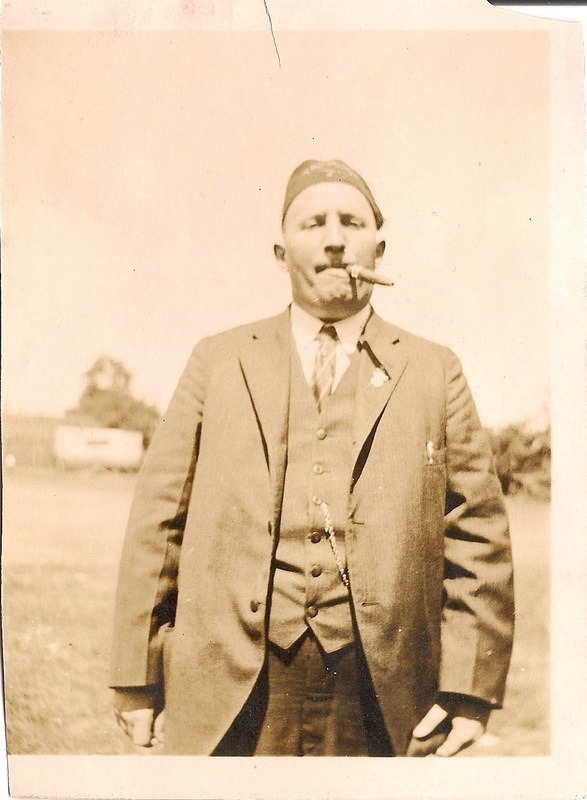 He has a cigar in his mouth, and he leans back away from the camera a bit, his fez is difficult to read due to the angle of his head. Fields seem to spread out behind him. Left edge is uneven, and the field of the photo meets it, almost as if it had been cut away, though unlikely. 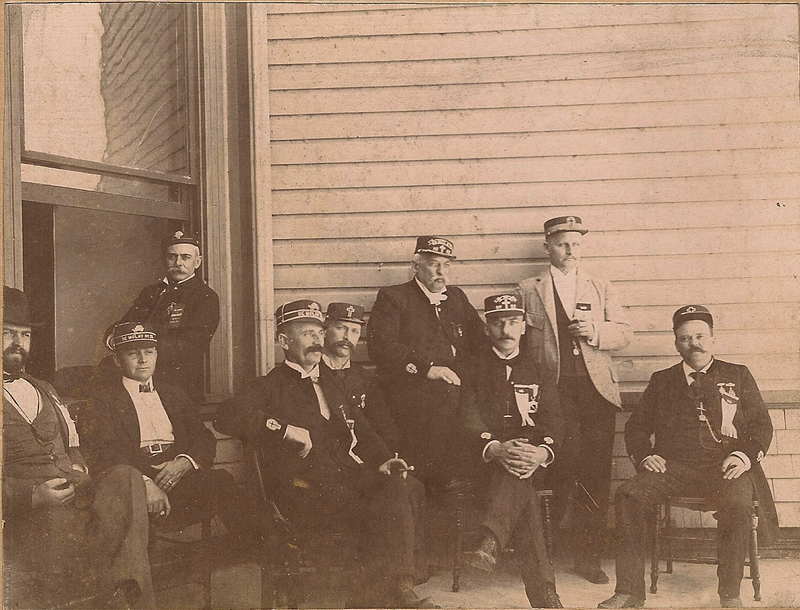 Albumen print informal group portrait of nine knights of the Ancient & Illustrious Order Knights of Malta, standing and sitting on a porch of a clapboard building. Mounted to dark cream colored card, but lacks any info or decoration on the mounting. Most of the men are seated, either in chairs or in a window. Two stand. All are wearing various medals, emblems, ribbons, or uniforms (which seem more like decorated suits) of the Knights Templar. Across the hats of several of the men can be seen the words, probably in bullion, “DeMolay No.22” or just “No.22”. On some of their cuffs and some of their caps can be seen KT crosses, some with crowns. Albumen photograph on embossed charcoal card backing which measures 5.75”x4.75”. Probably a late cabinet card. 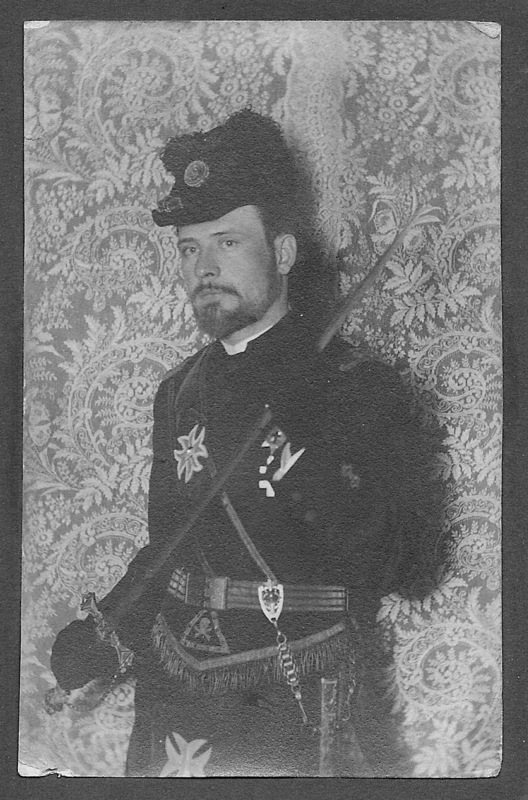 Portrait of an AIOKM (Ancient and Illustrious Order Knights of Malta) member in parade uniform. He wears the standard black uniform & black apron with flared Maltese crosses. His chapeau appears to have black feathers rather than white. His sword is drawn, and he holds it with one hand on the hilt and one high on the blade. He poses in front of a wallpaper or tapestry with vegetal or floral curling patterns.